Port Blair, Sept. 8: In a swift sea-air co-ordinated surveillance, the Indian Coast Guard ship Akkadevi, intercepted one suspicious vessel with 05 foreign crew (01 Myanmarese and 04 Thai) in possession of arms and ammunition approx 40 nautical miles south east off Diglipur, at 1630 hrs on Sept. 6. The Coast Guard Dornier on a planned surveillance sortie reported a suspicious vessel off Barren Island at about 1200 hrs on Sept. 6. On receipt of information, Coast Guard Ship Akkadevi on routine patrol was immediately diverted for investigation. The CG Dornier was re-launched at 1510 hrs to track the boat and Coast Guard ship Akkadevi was vectored towards the suspicious boat. 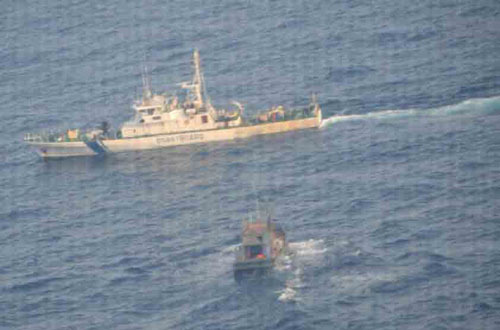 On interception of the suspicious vessel at 1630 hrs, the ship boarding party embarked the vessel for investigation. During investigation, it was found that the vessel was neither in possession of any documents nor was flying a flag of any state. The boarding party of the ship searched the vessel and discovered presence of arms and ammunition onboard. Considering this suspicious circumstances, the boat along with the crew was escorted to Diglipur for joint interrogation. The vessel along with the crew arrived Diglipur on Sept. 7 and were handed over to local police.